Call us if you need our towing services for an immediate response. While larger businesses are sometimes thought to provide poor, impersonalized service due to the scale of their operations, this isn't always the case. 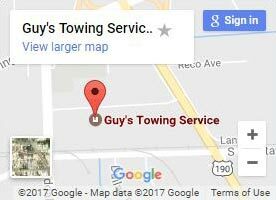 Guy's Towing Service proves the stereotype wrong. As the largest towing service in all of Lousiana, we've expanded primarily because of our dedication to friendly service, but our quick response time and affordable pricing don't hurt either! With 24-hour emergency towing every day of the year, we're always here to help. For residential vehicles including motorcycles, we'll arrive quickly and get to work. For towing RVs, trailers, and more, our fleet of trucks is ready and waiting for your call. Heavy duty trucks are built to handle large commercial and industrial vehicles. With a 60-ton crane system and airbag recovery, we're ready for any recovery job. We do load shifts, cargo transport, and more. Call or contact us for more details. Starting as a small tow truck company, over the last 40 years Guy's Towing Service has grown to become the largest towing company in Louisiana due to unbeatable quality and exemplary service. Your vehicle can stop working at anytime. Becuase it's so unpredictable, we aren't. Call us anytime, including major holidays, for friendly, prompt service and speedy dispatch. Our process is as easy as 1, 2, 3! 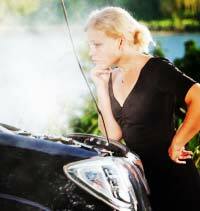 Towing and Roadside Recovery throughout Louisiana! While larger businesses are sometimes thought to provide poor, impersonalized service due to the scale of their operations, this isn’t always the case. Guy’s Towing Service proves the stereotype wrong. As the largest towing service in all of Louisiana, we’ve expanded primarily because of our dedication to friendly service, but our quick response time and affordable pricing don’t hurt either! While they’re called “light-duty”, these trucks are powerful enough to handle the majority of towing jobs. They can pick up cars and trucks with ease and can quickly hook up to your vehicle and get you on your way. Sometimes, a light duty truck isn’t quite strong enough or will have difficulty with a particular job. For these cases, a medium duty truck is often enough. They can tow large trucks, trailers, motorhomes, and more. Occassionally, a heavy duty truck might be needed for extremely heavy or hard to reach vehicles. This includes cars washed away in the state’s signature heavy flooding for underwater recovery as well.